Emanuele Gaiani, manages F.lli Gaiani at Desio (MB). With almost half century of history behind, F.lli Gaiani intends to represent a more and more competent partner to welcome the new challenges issued by the market. Know-how and experience that merge synergistically to satisfy the most different applicative requirements. In 2017, F.lli Gaiani will celebrate its 50 years of activity in the machine tool sector. The approaching to this goal will be scanned by important events, like the participation in primary sector exhibitions including the recent Mecspe in Parma that has aroused so lively success, the trade fair “Fornitore Offresi” organized last February at Erba (CO), as well as next Bimu 2014 that will be held at the exhibition pole of Rho Pero (Milan) next October. «Rewinding the tape of our first 47 years of activity – confirms Emanuele Gaiani – we are proud of assessing the results reached in time and the goals that our commitment has allowed us to achieve». In 1967 Pietro Gaiani and Amedeo Gaiani transformed the shed in the central zone of Desio (MB), from simple warehouse of electrical motors to showcase of the first conventional machine tools for metal and sheet metal machining. «The situation at that time – adds Gaiani – was not certainly comparable to today’s. Starting from the economic situation that, even if it had already lived the most advanced “boom” phase and was experiencing a period in which “rush” times were alternated to periods of neat downturn in which the influence of the world crises was felt, included a range of small widespread realities able to grant an abundant employment expansion». Expansion that has then led to move the company to the current headquarters in Via Milano 351 where, until the end of the Seventies, it was possible to proceed to the sale of the first lathes, milling machines but especially of press brakes and shears produced by primary national companies. The first collaborators of the company permitted then to enlarge more and more the array of customers, also reaching enterprises of outstanding importance in the national productive panorama of that epoch. «From that time onwards – adds Gaiani himself– let’s say around the beginning of the Eighties, it was an almost natural step to start the trade of NC machinery. Solutions able to represent a really historical “step” both for sellers and for purchasers, for the first time dealing with the unknown “computer” tool, as it was then defined». Also the sale of second-hand overhauled machines proceeded hand in hand for the company. Activity anyway already undertaken at the origins but that, with the passing of time, against the buyback of second-hand machinery as trade-in at the time of selling an article of new production, or in case of companies that ceased their activity for various reasons, represented over the years, particularly in times of economic stagnation, an important “basin” and a fundamental support. «Besides the home companies with which we had started in the course of the years – underlines still Emanuele Gaiani – were signed also important partnership agreements with outstanding foreign companies in the sector, some of which are lasting still today on exclusive basis in our competence area». 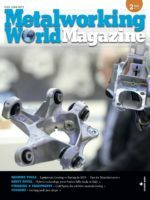 Concerning this, just to make an example, we might mention Emco Group (Emco Italia – Emco Famup and Emco MecofF) for stock removal machines, Meba for band sawing machines and Pullmax, Baykal and HM Scantool for the sheet metal working. The Pullmax X97 chamfering machine proposed by F.lli Gaiani. Today F.lli Gaiani employs 11 people and avails itself of various external collaborators for the sale activity, as well as some corporate realities able to offer a support in the service, overhaul and in the attainment of the conformity with the regulations in force regarding machinery. In this context the commitment lavished by the whole organization is aimed at enhancing the quality of products and services proposed to customers. This in order to approach the market with the best instruments to face the new challenges issued on the market. «All that – states Gaiani – without forgetting the guidelines that have always accompanied our growth over the last few years. Like for instance the availability of the chamfering machine Pullmax X97, nowadays indispensable machinery in mechanical steel structural works». Those who already know the “Pullmax” method appreciate its qualities, such as the excellent machining, the best environmental conditions, the elimination of sparks and noises. As a matter of fact, X97 operates silently and the sound emission, at full load, reaches 35 Db (A) maximum. The operator needs no protections and he is not exposed to fumes or vapours. The chamfering machine essentially operates like a rotary shears but with a single cutter, the piece feed in the machine is automatically executed. The method can be used for “X”-, “V”-, “Y”- and “K”-shaped joints, with variable chamfering angle from 25° to 55° (the angle can be easily read by a graduated scale and a high precision degree is assured) and maximum chamfering width equal to 25 in a 390 N/mm² a steel sheet. Since the machining is executed without heat, the cutting surface remains clean and unchanged by chemical products, making the machine suitable for machining aluminium and stainless steel. Another distinguishing aspect is the machine position, which can be varied to adapt it to the shape, to the weight and the dimension of the piece, besides the standard position, in fact, it can be suspended in both ordinary and upside down position. If the machine is suspended, instead of introducing the workpiece into the machine, we can move the latter along the component. The flask, during the rotation, is hanged to a crane, thus permitting its lateral displacement. If it is difficult, owing to the piece sizes, to reach the standard controls, the machine itself can be equipped with a remote control. It is also possible to chamfer circular pieces with a diameter exceeding mm 300 through the use of apposite equipment consisting of a guide roller and an adjustment device. 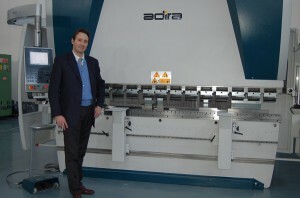 Automatic Meba band sawing machine model 335 G distributed by F.lli Gaiani at Desio (MB). Still proposed by F.lli Gaiani, there are also Meba sawing machines. Machines that, after a continuous evolution in the product range and in the intrinsic plant structure, last year reached a very important target with the marketing of the models called E-Cut 400. We are talking about executions that provide both for semi-automatic and automatic machines. «The main characteristic of these products – explains Emanuele Gaiani – is the almost total absence of hydraulic elements, with the introduction of electrical devices that manage cutting operations inside the structure». With the new Numerical Control system characterized by a screen, it is possible to input a standard cutting library including a total of 50 programmes. The presence of electrical devices, besides making the machine much more efficient and precise in machining, almost annuls the energy consumption in comparison with standard sawing machines, thus influencing an important cost centre in the productive ambit like today the energy ambit proves to be, in a Country where this resource has one of the highest costs in Europe.